Thrush is an infection of your horse’s hoof area and if it is left untreated, it can result in lameness and other serious issues. If your horse has thrush, it will be obvious because there’s usually a black, smelly discharge that comes from the hooves. You should always check for any abnormalities when cleaning the clefts of your horse’s hoof. 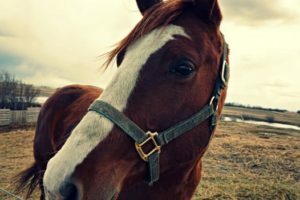 If your horse flinches when you are cleaning the area or are applying pressure with the hoof pick, you will know the infection most likely penetrated sensitive issue. Thrush can be easy to treat, if you catch it early. For tips on treating thrush, please read on. Thrush occurs when your horse is in muddy, dirty, and wet conditions but there are some instances when it happens in dry stables. Another reason it can occur is when the shoeing cycle is almost done and the flaps of the frog grow over the clefts. When this happens, the likelihood of dirt and moisture getting trapped within the frog increases. The best way to prevent thrush is to do regular cleanings of your horse’s hooves. You will want to really focus on cleaning out the clefts and not just the sole. Exercising your horse regularly can also help prevent thrush because it will increase your horse’s circulation and improve hoof quality. You will also want to make sure you are keeping the stable clean and dry. If you think your horse has thrush, you will want to get the farrier you use to look at your horse’s hooves and trim the frog. This is one of the most important parts of treating your horse’s thrush because it will help remove some of the infected parts of the frog and also allow air to circulate around the frog. Once the frog is trimmed, you will want to clean the hoof and scrub it with a stuff brush and warm water. Let the area dry completely before applying any thrush medication. If you are unsure of whether or not your horse has thrush or how to treat it, please consult your local experts or horse doctors. For high quality horse insurance plans, trust in the experts at Ark Agency! To learn more about our horse insurance plans, give us a call today at either (320) 243-7250 or (800) 328-8894.